Making your own beer at home is becoming a popular hobby. On the internet there are thousands of videos, web pages and blogs about beer and how to make beer. They vary from the basic through to complex, jargon filled technical descriptions. There are some funny ones too. And quite a lot of strange stuff. If you are interested, just search for a few choice phrases around the basic question of 'how to make home brewed beer' and you will find plenty to choose from. I have put a couple of my favourite web sites and books at the end of this blog. It can be confusing, with extract brewing, extract brewing (with grain) and all-grain brewing, not to mention the many different styles of beer and ale that can be made. 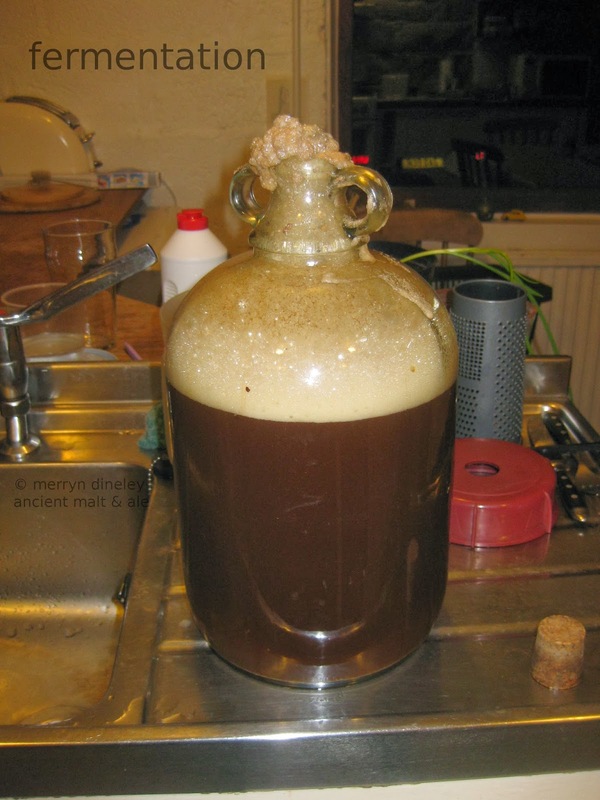 Home brewers often tend to have their own, sometimes idiosyncratic ways of beer brewing. However, it is all based upon the same basic principle - that grain can be easily converted into ale by the processes of malting, mashing and fermentation. Maltsters and brewers have been doing this for thousands of years. I aim to demystify the whole beer brewing process through this blog, and also to share some of our adventures with making ancient style ales. Here is our Juniper Yule Ale, just as it is beginning to ferment. We had made 6 gallons of wort and the big plastic fermentation bucket was very full. When the ferment took off it was so vigorous that there was not enough headroom in the fermenter. So we siphoned a gallon of wort into this demijohn and put an airlock on when it settled down. No sugar was added to this wort - it all came from the crushed malt in the mash tun. our ancient ale, bubbling away in the kitchen ... magic. There are two main ways to make beer at home. 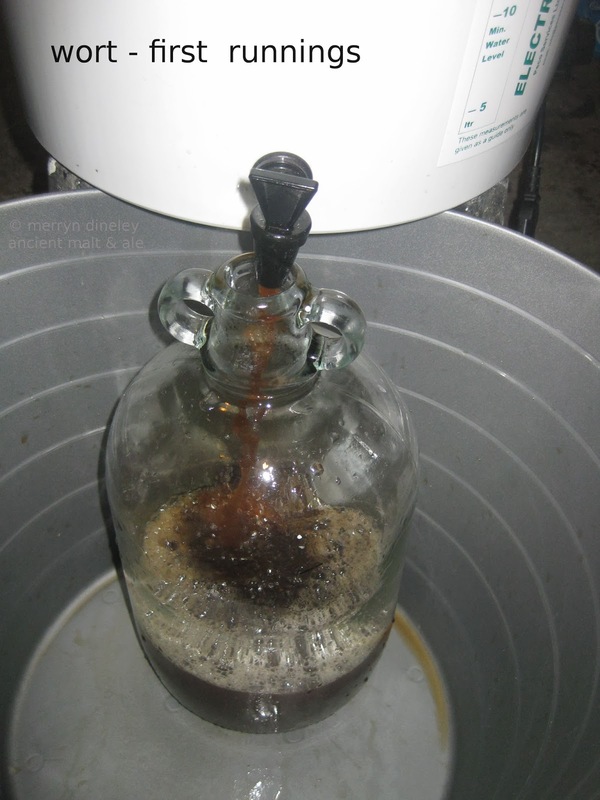 Use a brewing kit with malt extract, or go for the all grain brew. We don't use malt extract, although it is possible to make really good beer with it. We just prefer the flavour of all grain ale, and think that it is well worth the extra effort of making your own wort, then fermenting it. Traditional ingredients and techniques provide authentic flavours for ancient ales. 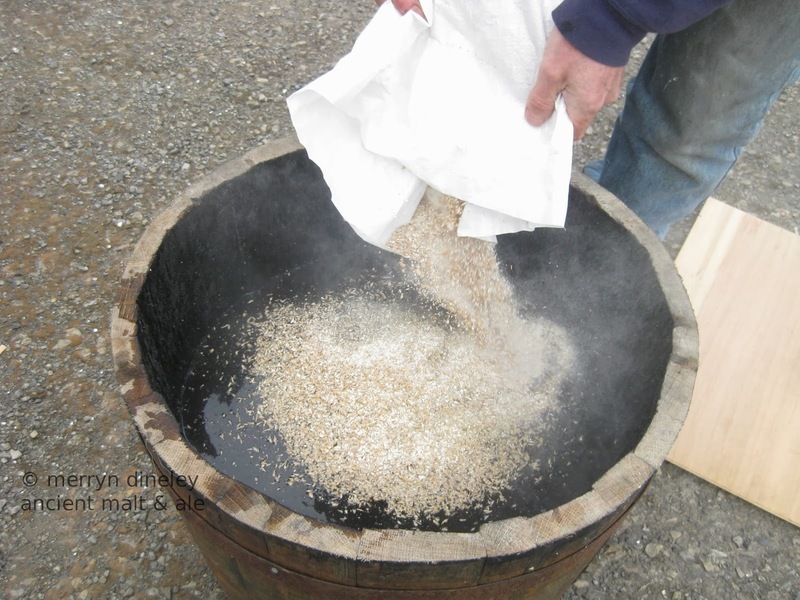 Crushed malt is the traditional ingredient for ale and beer. Any grain can be malted - wheat, barley, oats, millet and rye. Today, a bewildering variety of malts are available to the brewer and for every brew there is a grain bill. Also known as the 'mash ingredients' or the 'mash bill' by some brewers, it is the particular and specific mixture of crushed malts in the mash tun that create the colour, flavour and body of the resulting ale. The grain bill depends what you are brewing - bitter, porter, pale ale or stout for example. For our juniper ale, we mashed 15 pounds of pale crushed malt as the base malt, together with eight ounces of crystal malt and eight ounces of roasted barley for colour and flavour. From this, we got 6 gallons of wort that was boiled with a few hops and a couple of ounces of crushed juniper berries and then fermented into ale. It is important to crush the malt before putting it into the mash tun because this mixes up the grain starch with the enzymes that were activated during the malting process. Those breweries who use malt tend to buy their malt as whole grains, because it stores better, then they crush it in a grain mill before mashing. 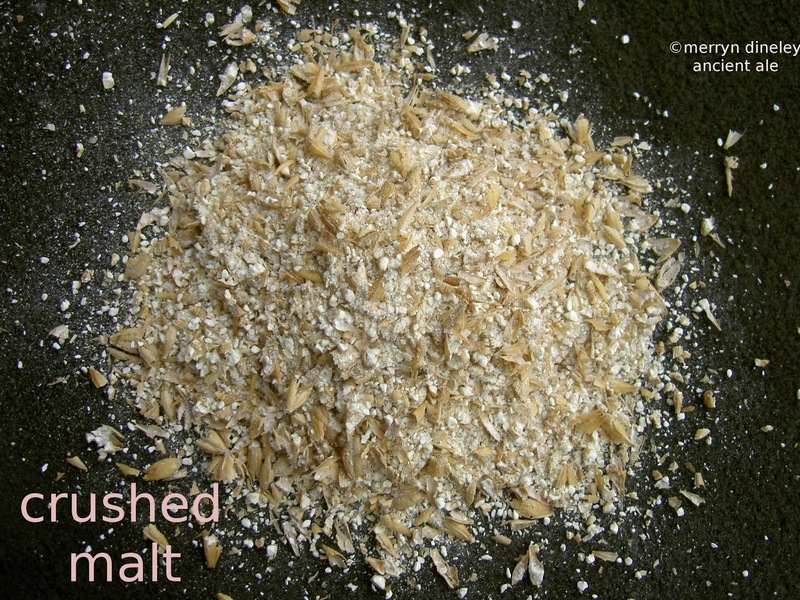 Crushed malt is also known as 'grist' and the photo shows some of the pale crushed malt that we use. You can see the grain husks. 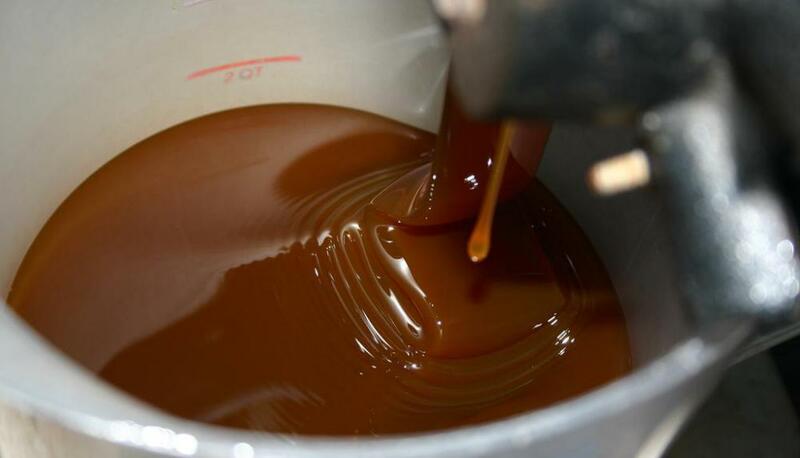 Malt extract is thick and sweet, like syrup. It is widely used in the food processing industry. You probably eat some most days, since it can be found in cereals, sweets, ice cream, cakes and many other processed foods. Today many home brewers and some of the big brewing companies use concentrated malt extract to make their ale and beer. There is no need for a mash tun. All you need are boilers and fermentation vessels. The mashing has been done for you, in the factory. Grain processing companies mash huge amounts of crushed malt, extract the wort and then concentrate it, by boiling it in a partial vacuum, to keep the temperature down. I was looking for a video that would show how extract brewing works. There are hundreds, if not thousands of them. I chose this one. In September 2012, the news story broke that President Obama wanted beer to be brewed in the White House. They chose the malt extract method. The recipe included a small amount of specialist malts for flavour, but the main ingredients were liquid malt extract and dried malt extract, with some special White House honey and pelleted hops. This seems to be the way that many people make beer at home. But not everyone. There are a lot of home brewers who still use malted grain. There are even some who make the malt themselves and crush it before putting it into their mash tun. There are others who want to make ales using traditional gruit herbs instead of hops, which were introduced in medieval times ... but more of gruit ales and traditional floor malting later. That is another story. For now, I just wanted to write a little about the difference between extract brewing and all grain brewing. And I think I have done that. ... our favourite brewing book is The Big Book of Brewing by David Line. First published in the 1970s, it is still in print. Excellent explanations of how to mash at home and it has very good, clear instructions and recipes. He wrote another book Brewing Beers Like Those You Buy. Also an excellent set of recipes for all grain brewing. I am not sure that all of the breweries that made those beers and ales still exist. The brewing industry has changed a lot since then. ... our favourite brewing history book is Beer: The Story of the Pint by Martyn Cornell. This blog was started last year but, for several reasons, I didn't keep it up. One thing that I found tricky was learning to understand the Jargon of the Blog Page. Over recent months, I have managed to get to grips with image editing software. I did that so I could copyright my photos. Now I have to work out how to do lots of other new things, like making tabs and all that stuff. I am slowly navigating my way through the 'construction' things and 'gadgets'. See what I mean? I'm not even sure how to explain what it is that I don't know what to do! I am not asking for help. I know that if I persevere, I will learn how to do this. Eventually. Sometimes you need to do something for yourself before you can say that you understand it. So far I have mastered quite a few 'computer things' and this blog is just another. The point I want to make is this: that every skilled activity uses jargon to explain the specialised knowledge, skills and tricks of the trade. Once you learn the vocabulary, the jargon, the particular methods and techniques it is relatively easy to do. But if you don't understand these things, then you can be faced with a very difficult task. Every ancient and traditional craft has its' jargon. Those of the maltster and brewer are no exception. Much of the jargon used by maltsters and brewers can be misunderstood by non brewers. It can lead to some very odd conversations between brewer and non brewer. I once spent a long time talking to someone about the possible archaeological evidence for malt and ale, only to discover later that he believed that I was talking about whiskey and ale. I thought it was a strange conversation at the time. Below is a picture of part of what I was talking about. Traditional floor malting. Not one of my photos, this one was given to me by Ivor Murrell, who was Director General of the magb between 1993 and 2006. The malt is raked as it begins to germinate on the malting floor. I was talking about 'malt' as in malted barley, partially germinated grain, the prime ingredient for ale, beer, lager and also whiskey. 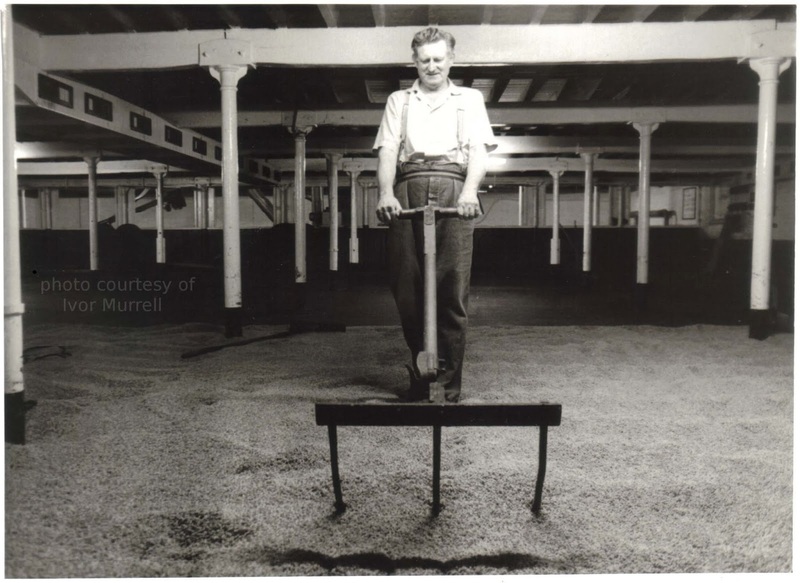 Malt is grain that has been steeped in water, then it is spread out on a smooth floor in a dark, well ventilated building to begin to germinate. It must be raked and turned, to stop the rootlets from becoming matted together, before being carefully dried in a kiln. Malting is an ancient craft. A complex craft. One that probably dates back to the earliest grain processors of the Fertile Crescent, over ten thousand years ago. It is important to crush the malt before adding it to the hot water in the mash tun. We now know that, at temperatures between 65 and 67 degrees Centigrade, the enzymes (amylase) within the malt are reactivated in the hot water. They convert, transform or hydrolyse the grain starch into malt sugars. The technical term for this is the saccharification.This is what happens in every mash tun, whether it is a modern one heated by electricity or an old fashioned one, for example a cauldron heated by a fire or a wooden tub or trough heated by hot rocks. 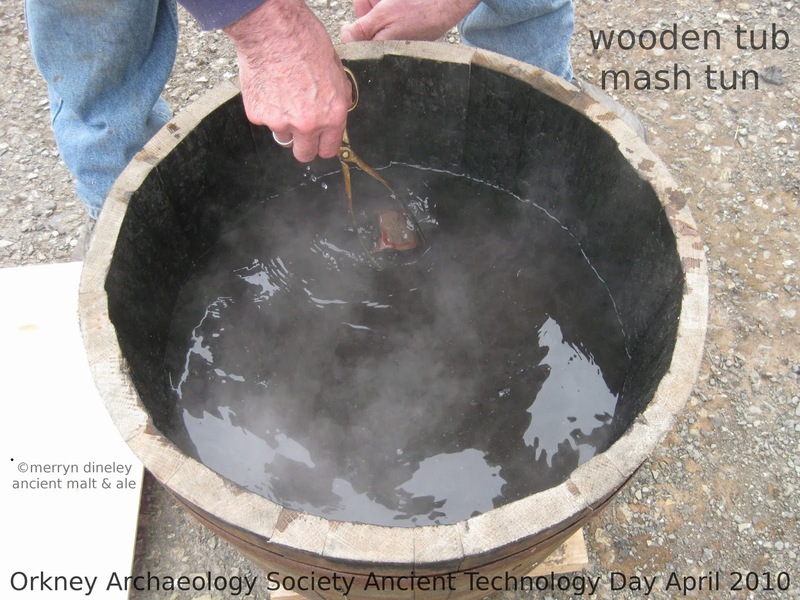 We ran a Viking style mash in a wooden tub and we got a good conversion of starch into sugars, using hot stones to heat the water and the mash. First of all, you have to heat the water to the correct temperature before you add the crushed malt. This is when you can see your face most clearly reflected in the hot water. Modern brewers use a thermometer. Before they were invented, brewers used this traditional technique, and it just so happens that, at 74 degrees Centigrade, the water becomes still enough to see a reflection. Hotter than that and it becomes too steamy to see anything. Cooler than that and the water surface is too 'bumpy'. Add crushed malt to hot water, maintain the temperature for about an hour and then lauter and sparge to obtain a wort. This involves running off the sweet wort from the mash tun (lautering), collecting the wort in a clean jug. The cloudy wort is poured through the mash until it runs clear, and then you can sparge, by gently pouring hot water through the mash to obtain several gallons of wort (sparging). The grain itself acts as a filter. The wort is boiled with herbs or hops and then, when it is cool enough, yeast or barm is added which ferments the sugars into alcohol. Barm is the foam on the top of a fermenting beer and many craft breweries 'harvest' the barm and use it to start new fermentations. We usually use about 13lb of pale crushed malt and we get 6 or 7 gallons of wort. Recently, we made a Juniper Ale for Yule, and we added a handful of berries, a couple of ounces or thereabouts, to the boil as well as the hops. There are some photos on my Facebook page here. We sent some bottles down to the Experimental Archaeology Conference, at Oxford University in January 2014 and there are some tasting notes here. What is wort? Wort is the sweet, dark brown liquid from the mash tun. It is what the brewer ferments into ale or beer. It tastes very sweet and it is the primary fermentable sugar for either ale or beer. Oh, and whiskey as well. Well, that's all for now. There is so much to be said about malt, ale and beer in prehistory and in historical times that I am sure there will be more from me soon. 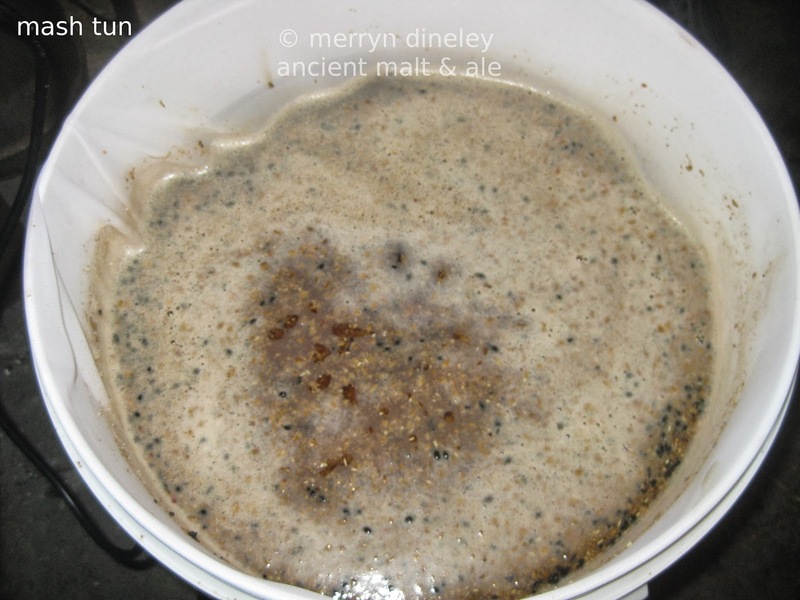 My published papers and my Master's Thesis, "Barley Malt and Ale in the Neolithic" which I did at Manchester University in 1998 are available as free downloads on my Academia.edu page. Here. It was published as a BAR (British Archaeological Report) in 2004.